May 2015 is set to be known to be as the biggest month of combat sports to ever hit the Philippines. On May 3, 2015, the Philippines will witness the biggest fight in boxing as Manny “Pacman” Pacquiao faces off against Flloyd “Money” Mayweather. On May 16, 2015, the UFC will be having their first ever show on Philippine Soil. And finally, on May 23, 2015 at Makati Cinema Square, the Philippine Wrestling Revolution will be putting on its biggest show ever and is looking to raise a spectacle the likes that Philippine Wrestling has never seen before. At Wrevolution X, not only will PWR commemorate its current year-long journey to help bring the art of professional wrestling to prominence here in the country but this show will also serve as the stepping stone for a new beginning of sorts for the once ragtag group of individuals who all shared dreams of having their own professional wrestling promotion. 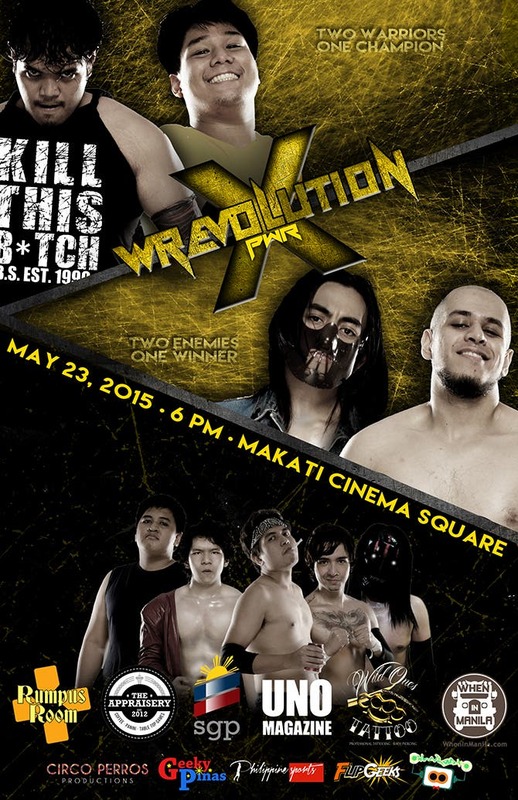 At Wrevolution X, there will be heated rivalries coming to blows, tag teams fighting it out to establish supremacy, wrestling technicians trying to make each other tap out, monsters looking to incapacitate one another, mortal enemies taking each other to their limits, and two warriors battling it out for the chance to become the first ever Philippine Wrestling Revolution Champion. It will definitely be a WREVOLUTION. Main Maxx and The Apocalypse, in terms of sheer size, is without a doubt the biggest rivalry in PWR today and this has been brewing ever since PWR’s first show, Renaissance. At Renaissance, Main Maxx was the first to pull the trigger as he laid waste to a number of PWR superstars in his path which unfortunately included The Apocalypse. At PWR Terminus, The Apocalypse fired back, attacking Main Maxx during Terminus’ Main Event. Finally, at PWR Vendetta, the two monsters of PWR made it official and have now placed themselves in one of the most brutal matches in professional wrestling – a last man standing match. Will the monster from your deepest darkest fears ring the Death Bell for Main Maxx or will Silent Rage go on a Blitzkreig and put a stop to The Apocalypse? Needless to say, there’s no love lost between Ralph Imabayashi and John Sebastian. Both outstanding athletes come from the same crop of PWR Bootcamp trainess and both had a stellar match agaisnt one another at PWR Vendetta. Ralph Imabayashi ultimately came out on top and in what was thought to be a sign of sportsmanship, John Sebastian reached out for a handshake and blindsided his opponent out of spite and gave Imabayashi a straight up beating. Later that night, after John Sebastian revealed he joined the Royal Flush and made his presence felt in All Out War, Imabayashi came out to even the odds and get a little payback against John Sebastian. Now, these two will face off in a rematch of their bout at Vendetta and will finally settle the score at Wrevolution X. Two of PWR’s most technically-gifted athletes will square off once again to see who is the better wrestler between the two. Ever since the beginning of PWR, the leader of the Panzer Army, Chris Panzer, and “The Social Media Sinister” Ken Warren, have been trying to one-up each other. At PWR Renaissance, Ken Warren drew first blood, while at PWR Terminus, Chris Panzer evened up the score. At PWR Vendetta, in a fit of jealousy after his loss to Bombay Suarez, Ken Warren tried to interfere in Chris Panzer’s championship contenders match against Jake De Leon only to be sent back by a solid Panzerschreck. Even though they both lost their chance to become the first PWR champion at Wrevolution X, Chris Panzer and Ken Warren will look to finally shut the other one up and find out who the better wrestler is in a submission match where the only way you win is if you make your opponent tap out. PWR’s tag division is on the rise and at Wrevolution X, we will find out which duo is on top. The team of the beer-guzzling Kanto Terror and the very colorful Mark D. Manalo, a.k.a “Beer Promdi,” will square off against the skillfully gifted team of Dual Shock (SANDATA & Peter Versoza) and the hard-hitting Fighters 4 Hire (Miguel Rosales & Joey Bax) in a 3-way Elimination Tag Team match. Will the fan favorite Beer Promdi continue to see success as a tag team? Will Dual Shock finally get that chip off their shoulders and prove themselves? Or will the Fighters 4 Hire pick up where they left off and dominate the competition? PWR’s longest running rivalry (call it a blood feud even) will reach new heights and exceed limitations at Wrevolution X when the anarchistic Mayhem Brannigan faces off against the King of the Royal Flush, “Classical” Bryan Leo. Ever since PWR’s first show, Renaissance, it didn’t take long for Mayhem Brannigan to show his dislike for the Royal Flush and their “we-own-this-place” attitude and Bryan Leo didn’t take that lightly, but that was only the beginning. At PWR Vendetta, after winning the All Out War with his partner The Apocalypse against the Royal Flush, Mayhem Brannigan also won the RIGHT to set the stipulation to a surprsingly Classical match, the Ironman Match. In a feud that has had people getting hospitalized, people going to jail, people getting fired, people being rehired, steel trays, lawsuits, aluminum bats, kendo sticks, thumbtacks, and dives off the second floor, we will now see these two mortal enemies go head to head to see who can outlast and outwrestle the other. Will we see the first-worlder live up to his classical moniker and take over this ironman match or will Mayhem Brannigan’s unconventional style and never say die attitude finally shut “Classical” Bryan Leo up? History will be made in the Makati Cinema Square on May 23, 2015. It’s no secret that the first ever Philippine Wrestling Revolution Champion will be crowned at Wrevolution X. The only question left to answer is, who will it be? Will it be the Son of a Haciendero, “The Senyorito” Jake De Leon or will it be the Heart and Soul of PWR, Bombay Suarez? These two warriors of PWR have a long history together. They both went through the PWR Championship contenders tournament, they teamed up together against the Royal Flush, and they have both been with PWR since day one where Bombay Suarez was actually the trainer for most of the current PWR superstars, including Jake De Leon. These two are more than just student and teacher. They think of each other as allies, friends, rivals, and brothers. However, at Wrevolution X, all of those thoughts of friendship and brotherhood are thrown out the window. When that bell rings, you can bet it will simply be Bombay Suarez vs. Jake De Leon fighting for the chance to make history and to become the first ever PWR Champion. At Wrevolution X, when one of these warriors places the championship belt around their waist, will we hear cheers of “Kill This B*tch” fill Makati Cinema Square or will we see “Minimum Wage and Maximum Rage” take over? Witness all of these great matches, experience home-grown Philippine professional wrestling, and see the New Beginning of PWR at Wrevolution X on May 23, 2015, 6:00PM, at the Makati Square Arena in Makati Cinema Square for only Php 250 per ticket. We are the revolution.